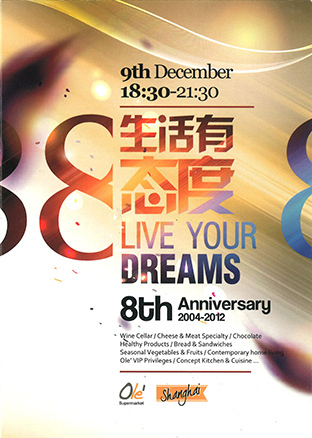 On Dec.19, 2012, Ole’hold the 8th anniversary celebration ”Live your dreams” at ShangHai opera. With attendance by the consul and chamber of commerce representative from 12 countries and regions which are Austria, America, France, Mexico, Italy, Sweden, England, Denmark, Korea, Israel, New Zealand and TaiPei. LongChen , the Vice GM of China Resources group, NiRuxiong, the CFO of China Resources Enterprise, and CaiLiBin, the COO of China Resources Vanguard attend the event. With the development of the Chinese economy, Ole’ has already tided over 8 years. always perceiving customer needs, Ole’ extended from the 1st store in one city to 30 stores in 14 cities, and built the high-end supermarket brands Ole’ and BLT successfully. The cooperated developers also extended from China Resources Land MixC to varies top-level professional real estate developer such as HengLong, Taikoo, Kerry, Kowloon warehouse etc. 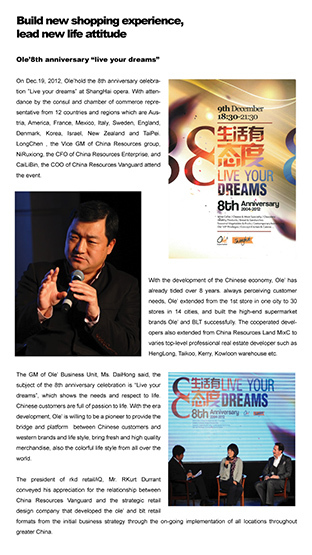 The GM of Ole’ Business Unit, Ms. DaiHong said, the subject of the 8th anniversary celebration is “Live your dreams”, which shows the needs and respect to life. Chinese customers are full of passion to life. With the era development, Ole’ is willing to be a pioneer to provide the bridge and platform between Chinese customers and western brands and life style, bring fresh and high quality merchandise, also the colorful life style from all over the world. The president of rkd retail/iQ, Mr. RKurt Durrant conveyed his appreciation for the relationship between China Resources Vanguard and the strategic retail design company that developed the ole’ and blt retail formats from the initial business strategy through the on-going implementation of all locations throughout greater China. copyright © rkdretailiq.com. All right reserved.